Serious inquiries only! 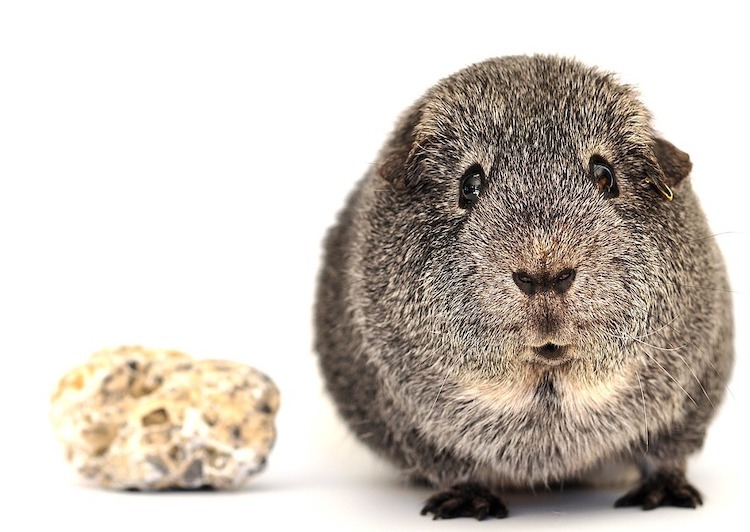 Guinea pigs are not the easy starter pets some people claim them to be, and we explain why. Guinea pigs are fun and social pets sometimes confused with hamsters and gerbils. But guinea pigs are slightly bigger than hamsters or gerbils, can have more fur than them, and have a rich history originating from South America. Guinea pigs are often referred to as “cavies,” or the singular “cavy,” because of their predecessor Cavia porcellus. They were in existence thousands of years ago serving many purposes. Guinea pigs lived in tall grasses for cover from predators and were used by humans for food, rituals and medicinal remedies. Years later they were domesticated and started appearing in multiple countries with a variety of new characteristics from breeding, such as fur variations and a wide array of colors. Present-day breeding purposes include food, pets and laboratory animals. Their average life span is 5–7 years. Guinea pigs are also inquisitive and vocal creatures with an extensive range of interesting sounds and behaviors. 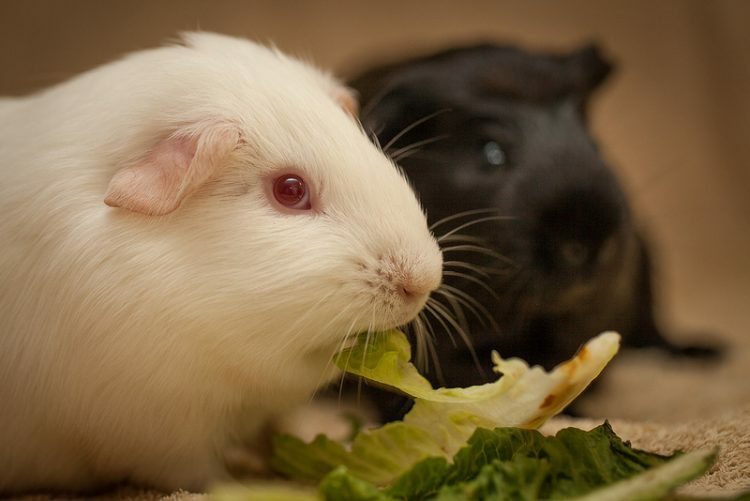 The most common misconception about guinea pigs is that they are easy to care for or make great starter pets for kids, but their specific diet and other factors require much more care and concern than people realize. These small, furry creatures have a magnitude of differences that distinguish them from other domesticated animals. They have specific dietary needs and can change their dietary habits as an indicator of health issues. Starting with the proper food and paying attention to eating habits can ensure you provide the necessary care and diet for your guinea pig. Many food types can be used as food for your guinea pig, but never provide pet food designed for any other animal. These foods were created and designed for specific animals that may not have the same dietary needs as your guinea pig. Guinea pigs are herbivores that love to graze and can eat during the day and night. Certain items are essential requirements to their healthy diet, and some additions, such as vegetables, can offer additional nutrition, provide some variety and help keep their teeth from becoming too long. Most guinea pigs are good at regulating their dietary needs. Monitor their intake and weight regularly to know if and when to adjust the amount of food you provide. Fresh water is essential. Water bottles with metal spouts are the preferred delivery system (some guinea pigs will chew plastic spouts). Some may drink more or less than others, but this is normal. Keep the water full and avoid adding anything to the bottle or water. Vitamin C is especially important to a guinea pig’s dietary needs. Guinea pigs have a unique need for vitamin C. Most animals make their own vitamin C, but guinea pigs, like humans, do not. In humans, vitamin C deficiency is called scurvy. If guinea pigs don’t get enough vitamin C in their diet, they become prone to many diseases. If they receive some but inadequate levels of vitamin C, they may appear healthy but have a decreased immune system and therefore be more susceptible to diseases. Your adult pig needs 20–25 milligrams per day of vitamin C, while pregnant piggies need even more. There are a variety of ways to ensure your guinea pig gets all the C they need. In other words, vitamin C is essential for guinea pig health. So how do you sneak this vitamin into your pig’s diet? Some vitamin C may be obtained in guinea pig pellets, a dry food offered daily as a diet staple. The source type of pellets can vary, so choose the one appropriate for your pet based on its age (alfalfa for those younger than 1 year old, and timothy for older pets). Most guinea pig pellets are fortified with vitamin C, but you cannot depend on a commercial food to provide an adequate amount. The vitamin C in pellets becomes less potent after 90 days. Environmental conditions such as heat and moisture can also alter the vitamin’s potency in the pellets — even guinea pigs on high-quality, pelleted diets still present with vitamin C deficiency. Guinea pigs being herbivores, feeding them meat and dairy should be avoided. The most natural and healthy way for guinea pigs to get their daily requirement of vitamin C is through fresh vegetables and fruits. Start early on in his life so your pig learns to enjoy experimenting with different foods. Take note: Broccoli, collard greens, mustard greens and spinach all contain oxalates, which can cause major health problems in guinea pigs and rabbits. Feed these vegetables to your guinea pig no more than once or twice a week. Hay is another essential component of the guinea pig diet. It helps keep their digestive system active and effective, keeps their teeth shorter and should always be available in a clean location or container (wire racks are common). Guinea pigs should eat lots and lots of timothy hay as their basic diet — it provides them with the fiber that’s important to digestive health. But hay does not give guinea pigs the vitamin C they need to ward off illness. Common types of hay recommended for guinea pigs are timothy and orchard grass. Hay can be used for food and as an additional bedding, so keeping a surplus on hand or buying in bulk is ideal for you and your furry friends. Avoid premixed variety foods and treats (additives or unlisted ingredients could be hazardous) and avoid poisonous plants and foods. Make sure all veggies added to your pet’s diet are thoroughly cleaned, fresh and not wilted. Remove uneaten items regularly to avoid the food spoiling in your pet’s habitat or play areas. Hay does not spoil and should be available at all times. Since some guinea pigs have a tendency to urinate on things, soiled hay should be removed along with regular cage cleanings. Vitamin C can be added to the water bottle, but this form of delivery has some disadvantages. Guinea pigs need to drink water, of course, but some just don’t like the taste of vitamin C added to it. But the bigger problem is you may not notice that your pig is drinking less — and this can be very dangerous to her health. If your pig begins to drink less water, it can cause dehydration and digestive problems, not to mention that your pig will not get the benefit of the vitamin C in the water. Vitamin C is also quite unstable in water, losing most of its potency within 8 hours or so. The best source of vitamin C supplementation for guinea pigs, other than in food, is through tablets or liquid given directly to your pig pal. Children’s vitamin C liquid supplements are over-the-counter products. If you can’t find them, speak to your pharmacist about ordering some. Guinea pig vitamin C tablets are also available through the Oxbow company. See which of these products your guinea pig likes. It’s a lot of fun to watch your guinea pigs munch on fresh veggies and hay. Get them used to food experimentation early, and you should have a healthy pig. In addition to urine, guinea pigs excrete 2 types of waste: hard pellets and soft pellets. Guinea pigs typically eat the soft pellets as they come out of their rear. Yes, this is gross, but it’s actually essential to their diet. When a guinea pig is sick and cannot eat its own soft excrement, the soft pellets can be taken from a healthy cavy, mixed with water and syringe-fed to the sick animal (watery excrement is not normal). This way, the sick animal still gets the nutritional value it needs. Offspring are born with full fur and open eyes, and they start eating the same food as adult guinea pigs within 2 days of birth. An unborn guinea pig develops permanent teeth while still in the womb. Guinea pigs eat some of their own waste as an essential part of their diet. Females are not normally neutered because the operation is more complex than altering a male. 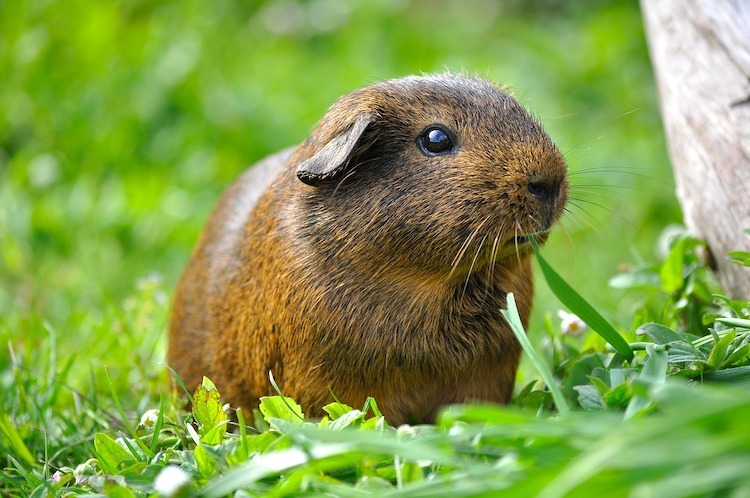 Next in this Ultimate Guinea Pig Care Guide, we discuss habitats — both indoor and outdoor. Happy, healthy and perky guinea pigs enjoy lots of space. A guinea pig will spend the majority of its time in a habitat, and it is very important to provide all the necessary components to ensure safety and fun. Cages are normally located indoors, and a well-maintained and designed habitat can ensure your pet stays happy and healthy. There are many reasons why outdoor habitats are not recommended, most notably because of health and safety concerns. Size does matter. Happy, healthy and perky guinea pigs enjoy lots of space. Pet store cages, aquariums or plastic enclosures can be small and cramped with little room to play. Cubes and Coroplast cages (C&C) are built using grids. The grids allow sight, smell and ventilation for your pet and allow for easy expansion when adding more companions. Place the habitat in an area of your home that stays within 60–85 degrees Fahrenheit, is free from extreme cold or heat changes, and is not in direct sunlight. 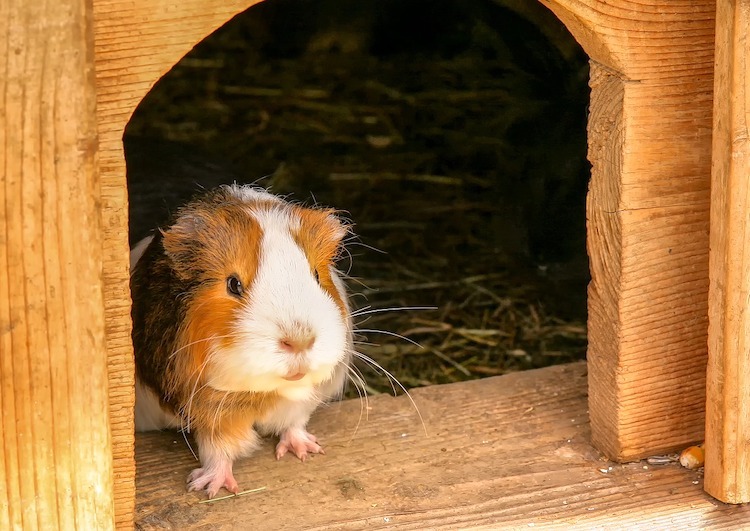 C&C housing is the most recommended method for housing guinea pigs, with a minimum size of 7.5 square feet for 1–2 animals. As additional animals are added, more space will be needed: Add 3 square feet for each guinea pig added when exceeding 2 in the same cage. Cavy Cages recommends avoiding grids with inner spaces greater than 1.5 inches as they may result in injury. You may be thinking, why so big? As mentioned previously, guinea pigs are grazing creatures that are active day and night. While you may allow your pets to play outside their cage when you are awake, they also need space to play when you are sleeping or not around. Being cramped in a small area and forced to use that area for eating, sleeping, playing and emitting waste doesn’t sound very pleasant. Go for the minimum size or bigger, and your pet will appreciate the space. If you have the available space, you can also create a guinea pig oasis. Never use cedar shavings or bedding material for guinea pigs. The aromatic oils found in these products can cause respiratory problems that may become severe. Common bedding materials include aspen, kiln-dried pine and wood pellets, and some use fleece for sleeping areas. Carefresh and Fresh News are commercially available recycled paper beddings that are common. You can try to use a litter box just for waste, but guinea pigs have a habit of going wherever and whenever they need. Some people use hay for bedding (as well as for food). Guinea Lynx recommends mixing it with another type of bedding since hay alone is not absorbent. It can also be placed in a raised wire rack to avoid soiling and still remain available to the guinea pigs. Guinea pigs must have a hiding area. Whether they burrow in bedding, run through tubes or other interior structures in their cage, they need to be able to hide when scared. This is essential to their feelings of safety and security, and probably originates from their South American ancestors. Thousands of years ago guinea pigs roamed the wild in areas of tall grass to hide from predators. While you don’t need to create a field, there are many items you can use to provide cover. Some of these you may already have in your home, and others can be found in pet stores and online stores. Some items can be cleaned as needed while others, such as cardboard rolls, need to be discarded when soiled. All hiding areas should allow enough space for your guinea pig to enter, exit and rotate its body safely and easily. If you have more than 1 guinea pig in the same cage, offer additional hiding places to ensure each animal has a spot to run to if needed. Regardless of your cage or habitat design, ensure your pet has access to food, water and a hiding place at all times. Obstructions or limited access to these items could distress your guinea pig and possibly cause other issues. Any guinea pig housed outdoors must be in a climate-controlled habitat, or the habitat may be in violation of the law. Temperatures for guinea pigs range from 60–85 degrees Fahrenheit. Temperatures at or above 85 will place your pet at risk for heat stroke — even in a shaded area — and can result in death. Guinea pigs living outside may not be as friendly and easy to handle as others that are kept indoors and interact with people frequently. An outdoor living area also makes it difficult to recognize signs of illness. Additionally, wild animals might find a way into the housing and cause injury or death. For these reasons, outdoor habitats are rare. As our Ultimate Guinea Pig Care Guide continues, we will next discuss behavior and companionship. Guinea pigs are the life of the party! 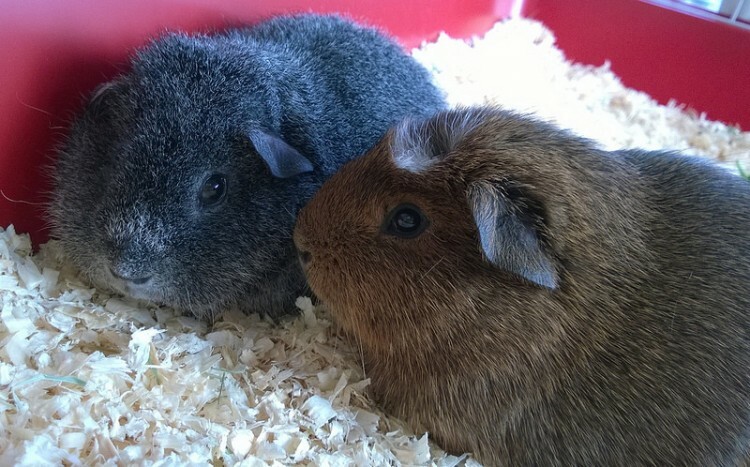 These little furry guys are super social creatures, and they love company from other guinea pigs and humans. Some even become friends with the family cat. Most guinea pigs are happiest with a companion. New companions are at an advantage to adjust faster by following the habits of the existing pet. They can play together too, and play increases exercise and mobility. Cats and dogs are seen as natural predators and may scare your guinea pig. If you want to introduce a cat or dog to your guinea pig, do so slowly and with supervision. Never leave a guinea pig alone with any other type of animal (even if they have appeared friendly in the past) or in the care of children. Whether 2 guinea pigs are compatible or not is down to their personalities instead of gender. Rumor has it that males will fight each other, but some guinea pigs may fight with any addition regardless of gender. Some people report that ideal combinations are neutered males with females or females together. If you do add a new companion, keep in mind that just as with any other pet you should supervise their interaction until you feel comfortable there is no hostility. If they do fight and you have to separate them, protect your hands with a towel, oven mitt or other item to avoid being bitten. Bite attacks are no longer warning nips. They are lunges with intent to harm. Raised hackles, loud and angry teeth chattering, and “rumblestrutting” in place with the head staying in one position while facing the other guinea pig doing the same thing are usually signs of an imminent attack. But the animals may back down before they engage. Both pigs rear up on their haunches, face to face. This is a clear, brief signal of their intent to launch full attacks. Separate them quickly before anything happens. Full battle: The pigs are locked in a vicious ball of fur. This is serious. Carefully separate them immediately — throw a towel over them and use a dustpan or something other than your hand to block them off from one another. Their very sharp teeth can cause serious damage to you. While you will be terribly sad at the loss of your guinea pig, it will be really important to monitor your survivors to ensure that they are not refusing food and water. Guinea pigs can be great snugglebunnies, but they do need time to establish trust with you. Offering treats is a way to engage them to interact with you. They also jump and run about in what is called “popcorning,” which looks a bit like a one-man dance party. Guinea pigs do get startled easily, so move slowly and speak in a regular voice. If they are comfortable enough to allow you to hold them, be careful not to drop them and keep a towel or cloth underneath them for any mess. Children should be supervised when handling guinea pigs; the animals are easily injured and can bite if handled incorrectly. Guinea pigs have so many sounds! They are vocal creatures that love to chatter their teeth, squeak, “wheek” and chirp, although not all guinea pigs will do this. Some will make purring sounds, growls and a variety of other vocal communications to display happiness or unhappiness. By observing the behavior along with the sound, you might be able to determine what your pet is trying to tell you. There are no set times for chit chat. Guinea pigs can chirp or chatter during the day or night. Most chatterboxes will be active during feeding, providing veggies, fresh hay or when interacting with one another. Guinea pigs can also be particular about the sounds they hear. Some will chatter or make noises when they hear things they don’t like, and each one reacts differently. Some dislike music, keys clanging, doorbells, phones ringing and much more. Guinea pigs get startled easily so it’s natural for them to pay extra attention to sounds in and around their environment. 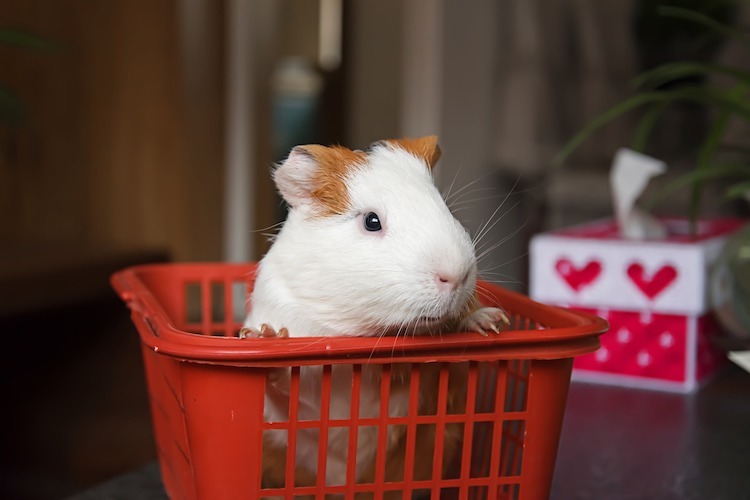 If you find that your guinea pig is more sensitive to common sounds around its cage that are pretty consistent, you might want to think about moving it to a more stable and quiet location in your home. Guinea pigs are also no strangers to social hierarchies. If you place a large number of guinea pigs together, a hierarchy may be formed. This may cause a shy pet to become more withdrawn or bullied by the other guinea pigs. If you do keep several pets together, spend time monitoring their interactions whenever possible to minimize any behavior similar to this. Next in this Ultimate Guinea Pig Care Guide, we discuss health and illness. Usually the first sign of illness in a guinea pig will appear as a weight loss. Guinea pigs, like any other animals, can live their lives happy and healthy with the right support. When it comes to sickness, guinea pigs have many possible illnesses and conditions and require an experienced veterinarian. Cavy caregivers swear by the scale. It is important to weigh your guinea pig every day to look for weight changes. Usually the first sign of illness will appear as a weight loss, and watching the weight consistently will give you a good idea of your pet’s average range. Keep a small notebook or chart near the scale and note the weight any time it is checked. Some changes in weight can be small initially but continue, and you want to be able to see if weight is decreasing or increasing over a longer period. As discussed before, a proper environment should be clean, safe and designed specifically for guinea pigs. Your pet can be bathed with baby or small pet shampoo, just make sure to rinse and fully dry before returning them to their cage. Keep the nails clipped regularly and watch the length of the teeth for eating problems. Their diet must contain the appropriate foods and treats to keep them healthy and clean water given daily. Safety is important for the cavy’s environment and their interaction with other animals and handling by people. Other animals can cause injury or death, and sometimes just the stress of being threatened by another animal can leave a guinea pig susceptible to illness. Always monitor these interactions and ensure your pet has a safe place available to hide when needed. Other symptoms besides weight loss can be warning signs for illness, so it’s important to look for them every day. Stress increases the vulnerability to disease and other illnesses. If you notice any of the above symptoms or anything out of the ordinary, check the weight and look for other signs. Check hair for matting, eyes for excessive drainage and the color and consistency of the droppings. You should also consider quarantining your pet from other cavies in case the illness is contagious. Make an appointment with your vet to get it checked out. Often the animal can die from delayed care. If there is any activity that causes your pet to squeak, such as during urination, movement, eating or other activities, check them thoroughly and make an appointment with your vet. Guinea pigs feel pain but often do not show it visibly. The above symptoms or their vocal outbursts may be trying to tell you something. The most commonly prescribed medications for guinea pig health problems are antibiotics, but not all drugs are safe for your animal. Make sure your vet is trained and experienced with guinea pigs, and always check any prescribed medication before administering it to the animal. Guinea pigs should never be given certain medications since they can cause illness or death, especially penicillin-based drugs. Never assume your vet is experienced with guinea pigs. 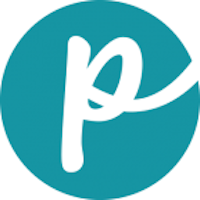 Always ask about their training, experience treating them and if they have any other patients like yours. If they do not, ask for a recommendation for another vet or find your own. Vets who are listed as exotic animal veterinarians may have more experience than the neighborhood animal facility and some areas might just be too rural for a qualified vet. In the final part of this Ultimate Guinea Pig Care Guide, we discuss the guinea pig communities and replies from real caregivers. From feed and diet to illness and squeaks, the Guinea Lynx community is impressive for the vast amount of areas it covers. That because they are short-lived (2–3 years) and cheap to purchase, it is acceptable to have them put down at the first sign of illness and easier to purchase a replacement rather than treat them appropriately. They’ll be OK if let loose in the neighborhood/woods when kids are over their interest in them. They have little to no individual personality and are boring pets. That they eat their young and are dumb. Absolutely! People here know everything about all pets, and if they don’t know themselves, they point you in the right direction. Dogs, cats, tortoises, rats, fish, crawdads … you name it. Yes! People generally don’t have the patience or interest in hearing about guinea pigs at length. Here you can geek out about your pigs and not get the eye rolls that you would from people who don’t have guinea pigs. I think the pig name that stands out for me from over the years is Bing. He was a guinea pig celebrity. Currently, I care for Stinker McStinkpants. He’d probably take the title of funniest name of the 4 I have now. Sir Scrotumus and Evil Pig. In the UK — veterinary knowledge and experience with pigs. Publicizing pigs available from rescues/shelters. For many years of owning a guinea pig, I had never even considered that they could be found in shelters, just like cats and dogs. Babies, too! People who know about shelters may shy away from them, thinking that they’re all older guinea pigs, but a lot of people drop off pregnant pigs, so there are always plenty of babies! If you could give only one piece of advice to a prospective owner, what would it be? Double check that you have a veterinarian handy who is very knowledgeable about guinea pig care and treatment. A vet with casual knowledge generally won’t cut it — and can sometimes be dangerous if they are unaware of certain “no-no’s” concerning guinea pigs. What is the most common or dangerous mistake people make with their pet guinea pigs? Not providing veterinarian care when the guinea pig is sick or waiting too long to see the vet. Feeding them the wrong food and breeding them (and with dogs, not training them). There are many wonderful reasons to adopt a guinea pig as a pet, and by being prepared for the care involved you can be sure your new furry friend is around for years to come. We hope you have enjoyed this care guide from Petful, and we hope it helps explain the wonderful world of guinea pigs and all they have to offer. Please leave a comment below if this guinea pig care guide has helped you! There are many online resources and communities dedicated to guinea pigs. Detailed diet and nutritional information can be found on Guinea Lynx, Kornage (UK) and Seagull’s Guinea Pig Compendium. Rhody, Jeff, DVM. Vitamin C Supplementation for Guinea Pigs, VIN. 2016. Petful editor in chief Kristine Lacoste did most of the research and writing, and Dr. Debora Lichtenberg, VMD, contributed health content to this Ultimate Guinea Pig Care Guide. Melissa Smith also contributed. We would like to extend a special thanks to Guinea Lynx and its members for taking part in our research and opening their community to supplement this comprehensive guide. Additional appreciation goes to Erin Moore for her advice and expertise as a guinea pig caregiver for over a decade.